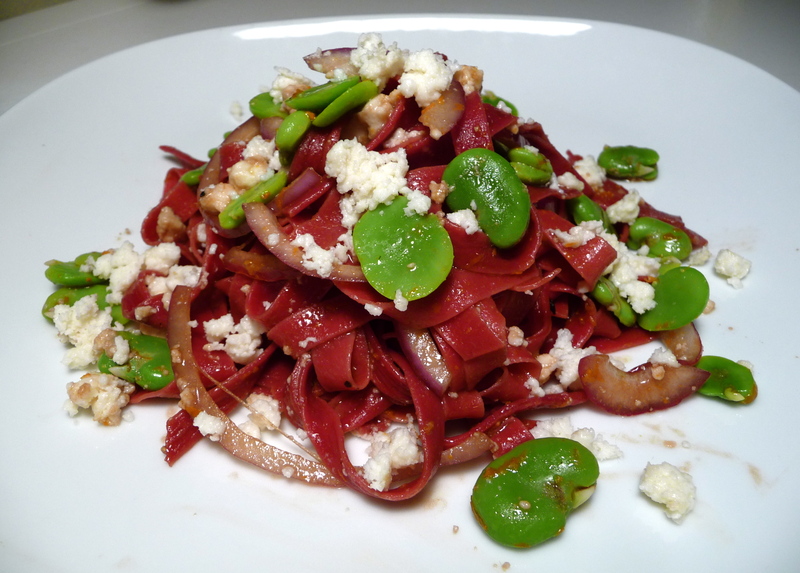 I was lucky enough to swap for some fabulous, homemade, beet pasta at the LA Food Swap a few weekends ago and last night I finally thought of a recipe to complement that gorgeous red color. These almost neon colored fava beans could not be more perfect against the bright pasta. Well, maybe they could, but I’m not going to go there. I was nearly blinded plating this dish. And then I was starved. And then the pasta disappeared five minutes after this photo was taken. You know, because I have incredible willpower…. I also added some crumbled queso fresco, red onions, balsamic vinegar and olive oil to this dish and I felt like Spring had sprung! Like right there, on that white plate, the greens and pinks of April were upon me. I almost cried. And then I soppped up my tears with some french bread. Because french bread is very absorbent, especially on food-related tears of joy. So here it is, in all its beauty. I kind of want to make it again just to stare at it. Or maybe I’ll blow up this picture and frame it in my kitchen. And then drool on that picture. And then I’ll have to reprint it because of the drool marks. Which totally makes me think of a certain Curb Your Enthusiasm episode…but we won’t go there. The Beet Pasta was made by the incredibly talented @misschiffonade and you can find out more about her here, or read her posts at TheKitchn.